With a bloodhound’s assistance, a ranger tries to track poachers who killed this elephant and cut off the front of its head to get away quickly with its ivory tusks. Despite such incidents, the park now has up to 400 elephants, with many crossing the border from Uganda. In the park, near the village of Vitshumbi, rangers find a hippopotamus skull and a lizard skin, signs of a temporary poacher camp. Virtually every time they are out on patrol, rangers discover evidence of poachers, who may spend a week or two in the bush before packing out their haul and selling it. Rangers apprehend one of the poachers from the temporary camp. He’d been headed back to the site when they spotted him and chased him for miles. He will likely pay a fine, spend time in jail, or both. The rangers are experienced trackers who rely on footprints and broken grass to pursue poachers through the bush. The contents of bags dropped by five FDLR fighters after a firefight with rangers include the legs of a bushbuck, a hyena skin, hippopotamus meat, and ammunition. 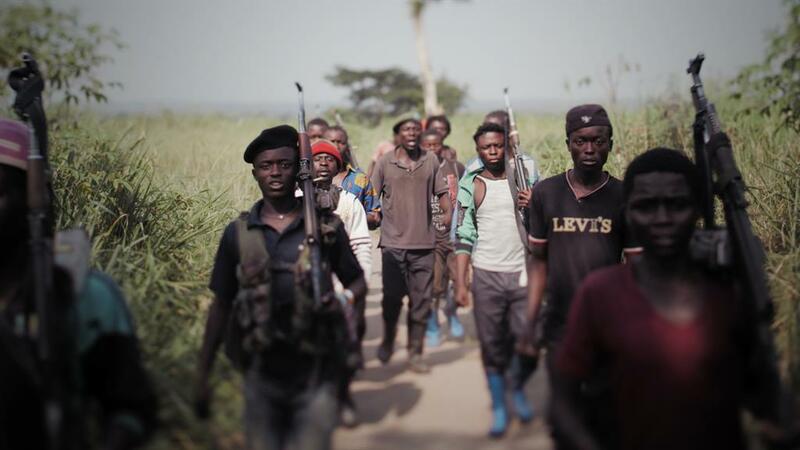 Since Hutu fighters formed the militia in Congo after fleeing Rwanda, the FDLR has killed some of the park’s rangers and exploited its resources. The complex struggle for power between park rangers and armed groups.